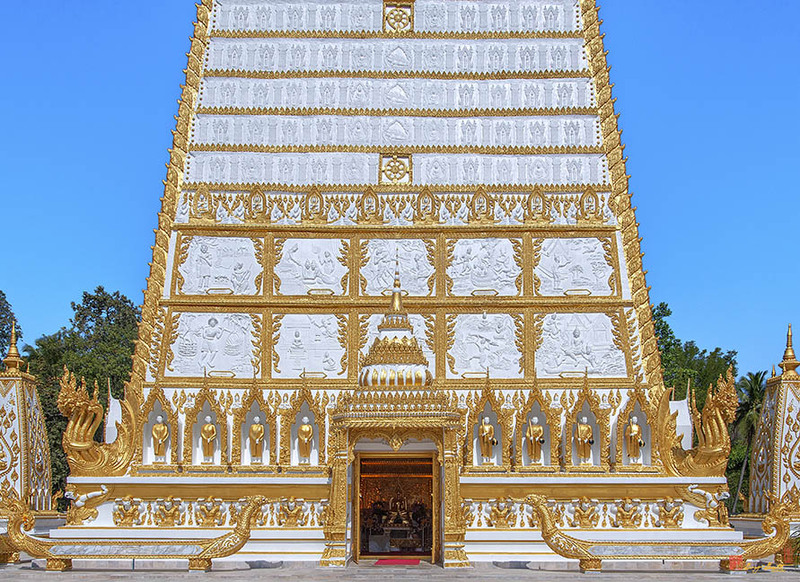 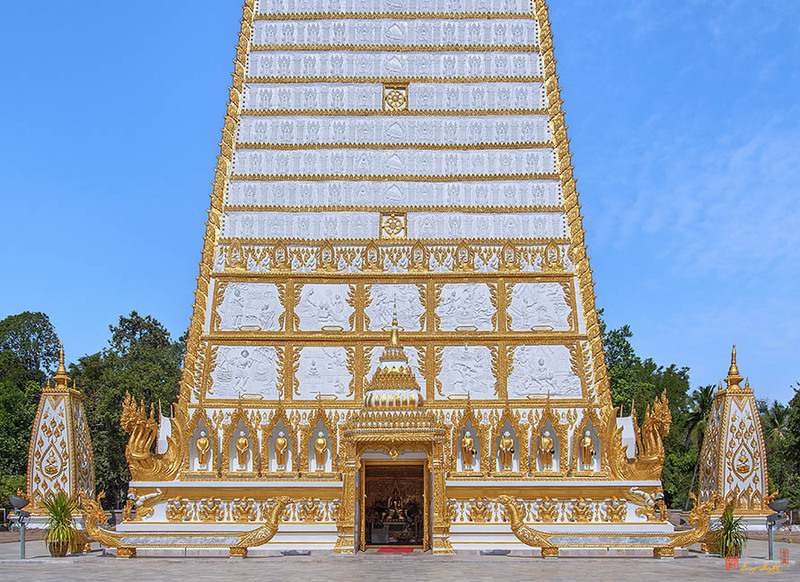 Wat Nong Bua or Prathat Nong Bua, วัดหนองบัว หรือ วัดผระธาตูหนองบัว, is a temple located in Ubon Ratchathani. 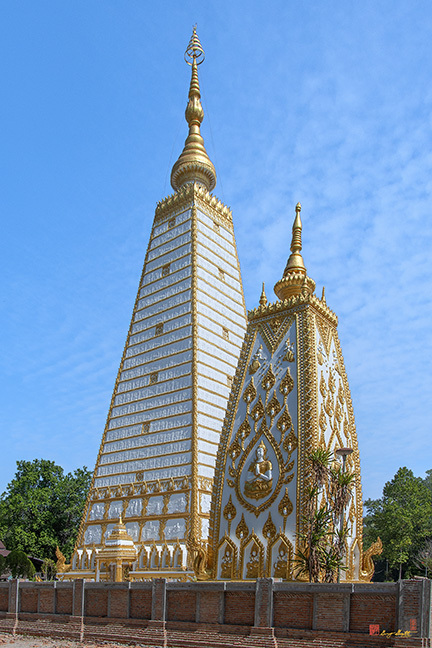 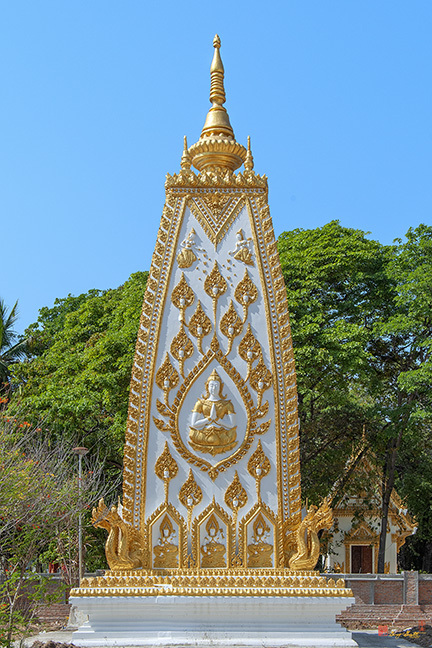 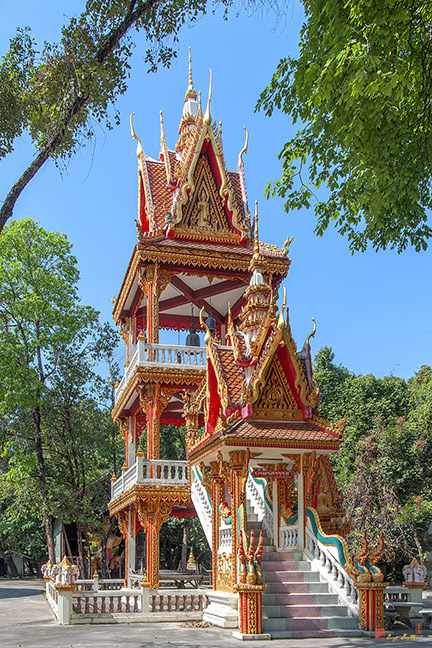 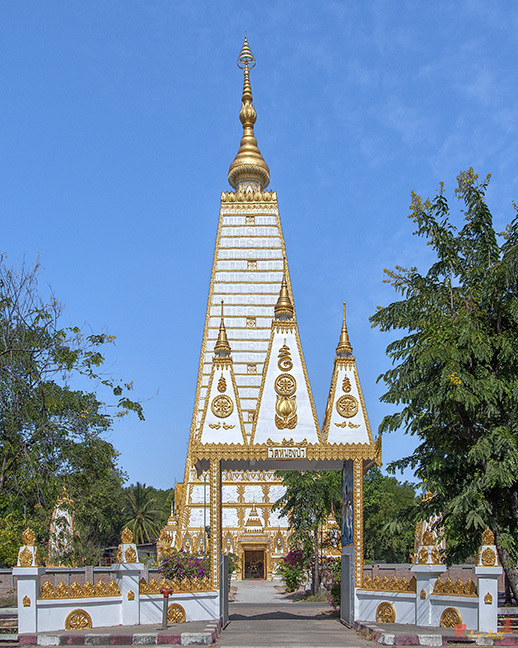 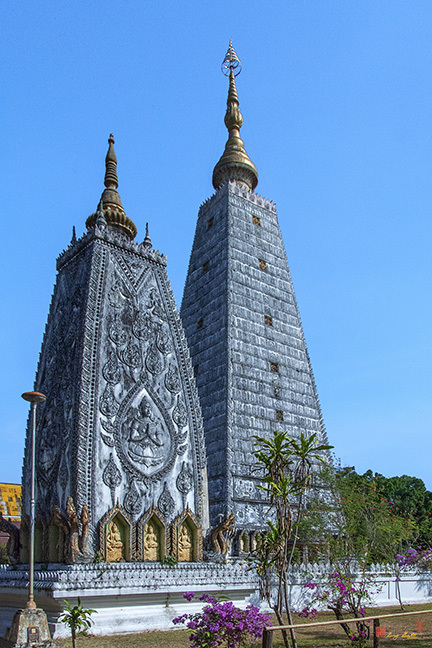 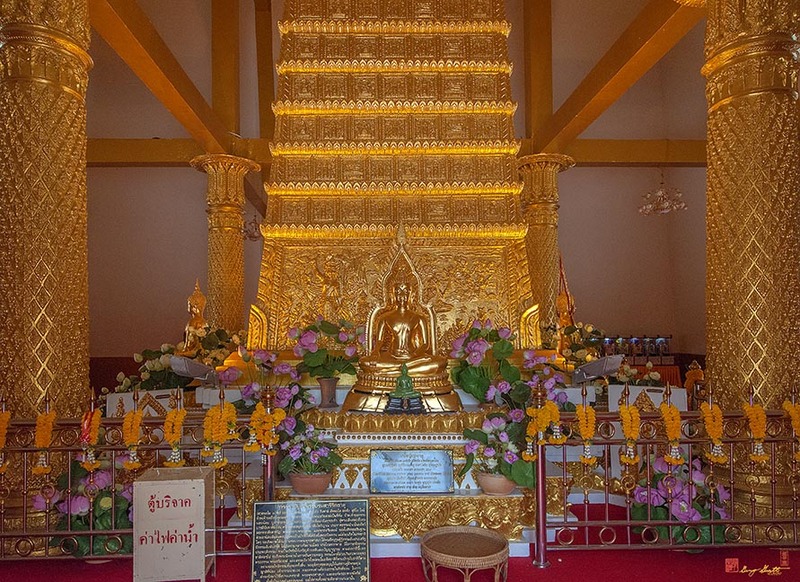 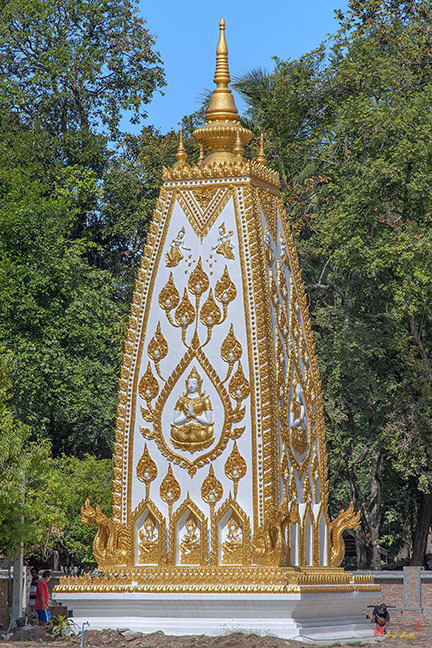 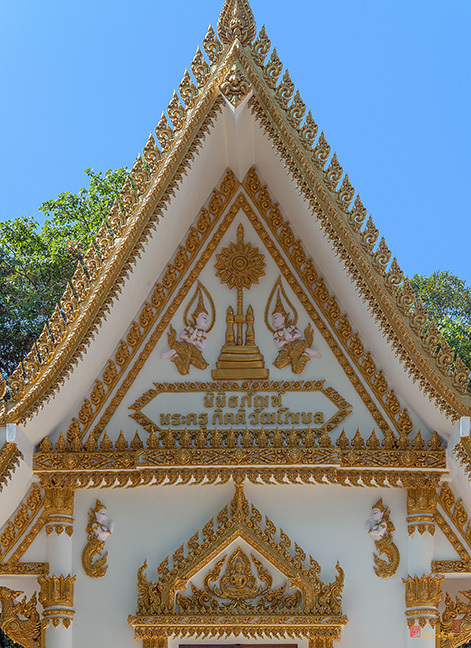 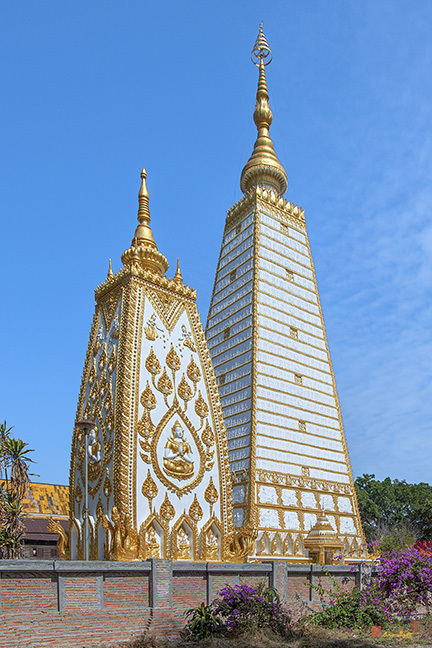 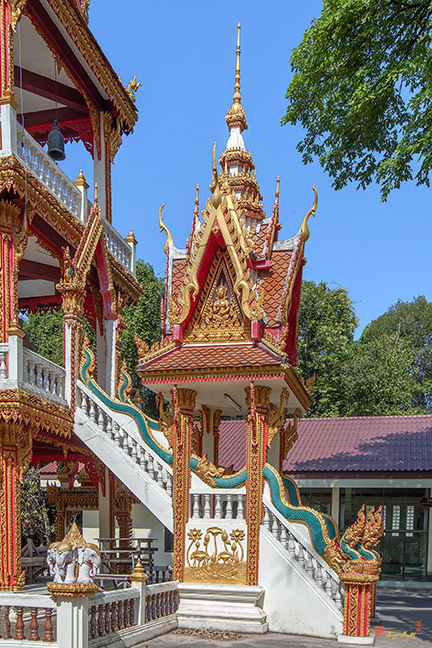 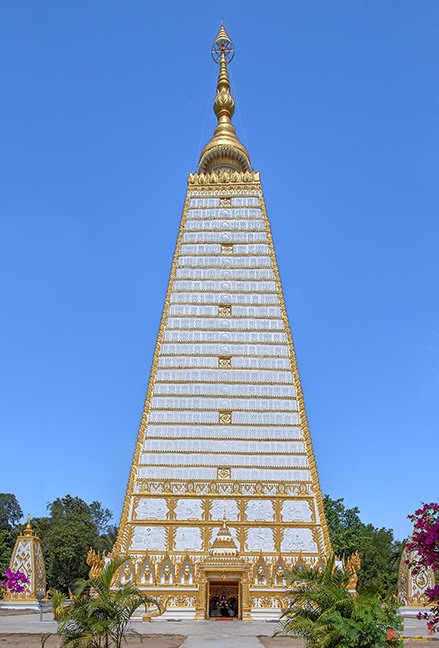 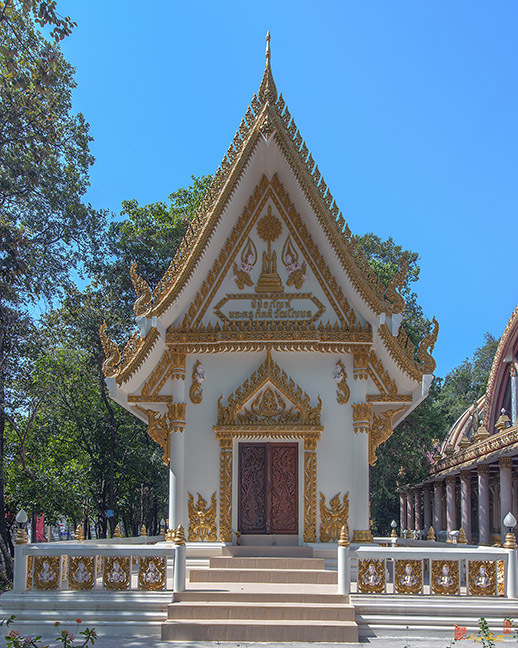 The temple is famous for having the only example in Thailand of a Buddhagaya-style stupa. 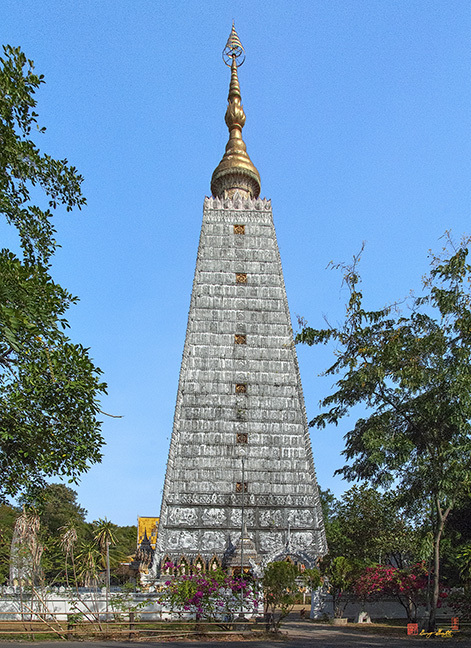 The stupa, Phra That Chedi Si Maha Pho, พระธาตุเจดีย์ศรีมหาโพธิ์นั้น, consists of a central stupa with a smaller stupa at each corner of the compound wall. 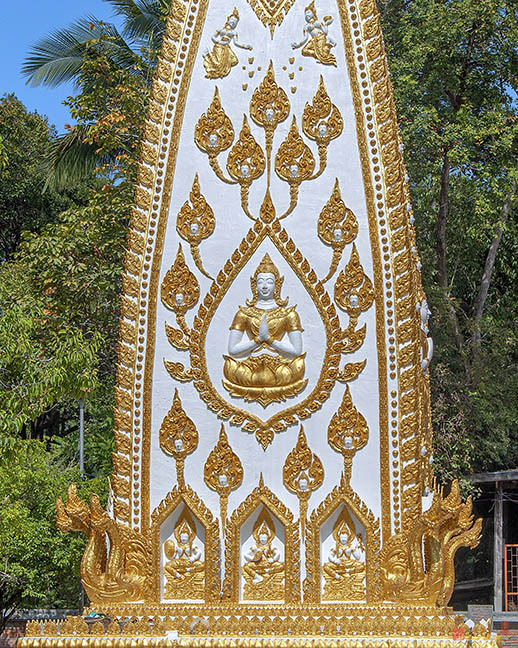 This style of stupa with a small golden chedi on top is named for Maha Bhothi Wihan at a famous temple in Buddhagaya India (also spelled Buddha Gaya, Buddha Khaya and Bodh Gaya), the holy birth place of the Lord Buddha. 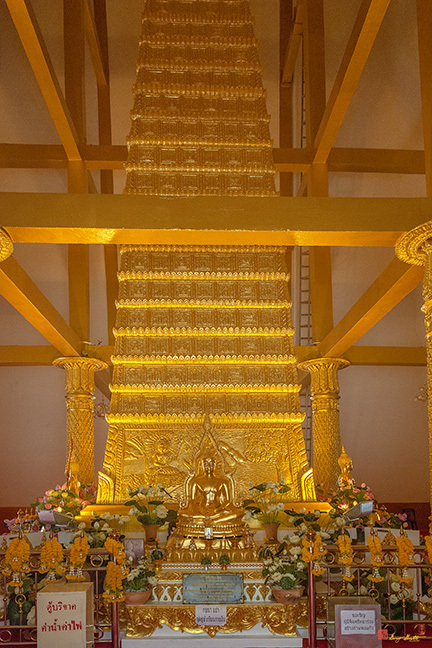 Within the central stupa, are several important Buddha images. 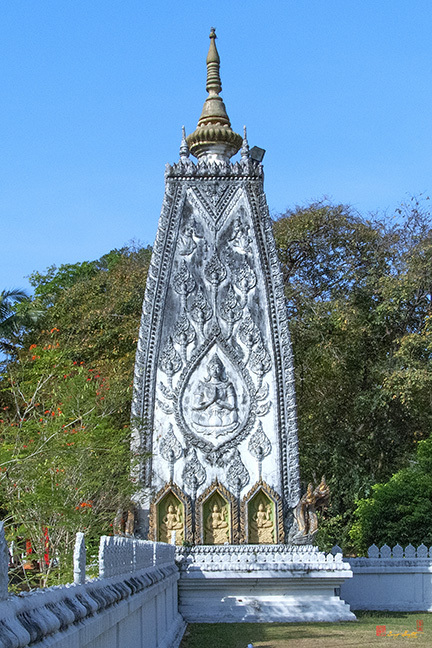 The stupa also features local Isan arts. 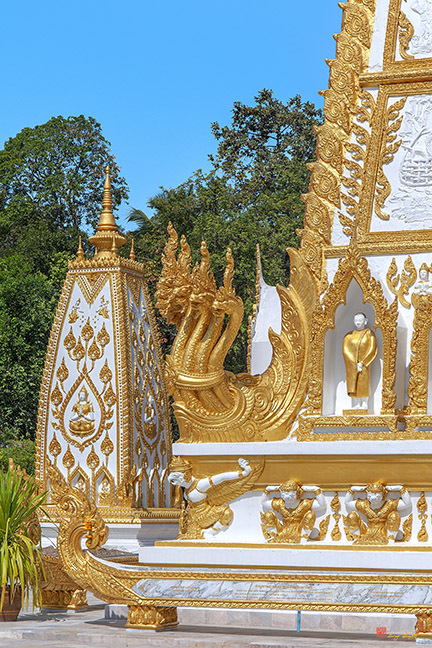 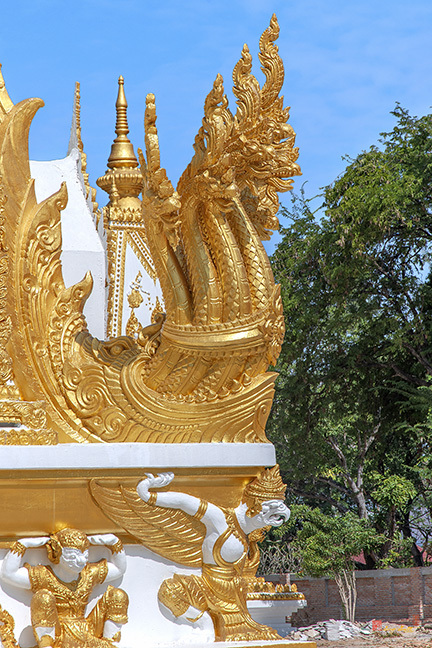 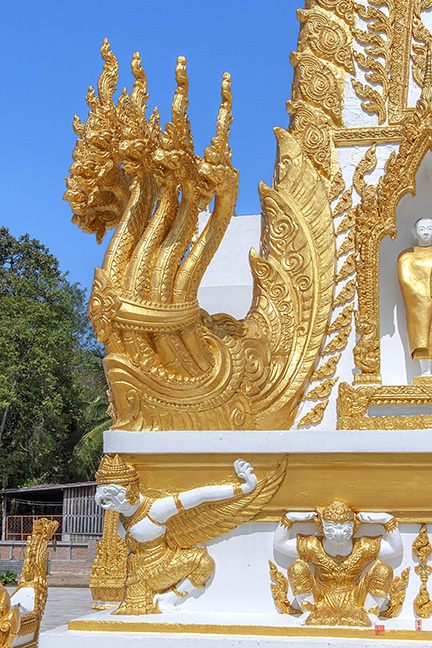 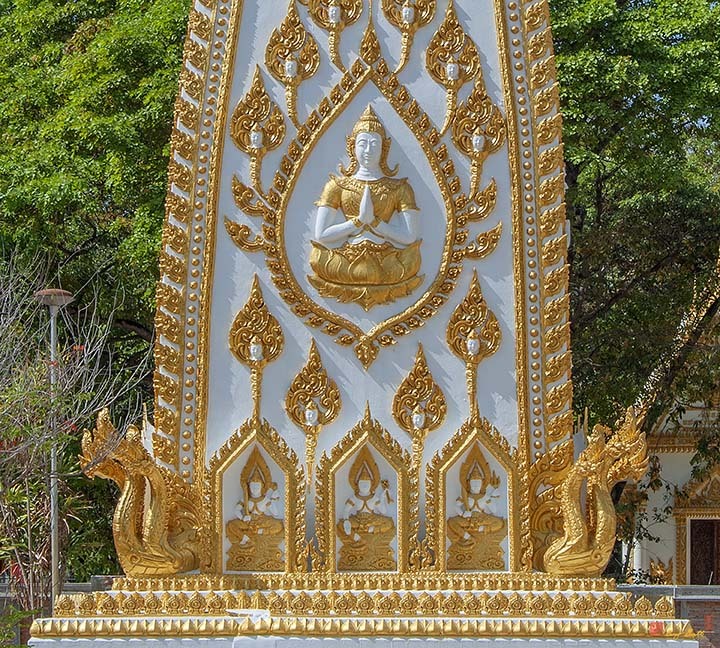 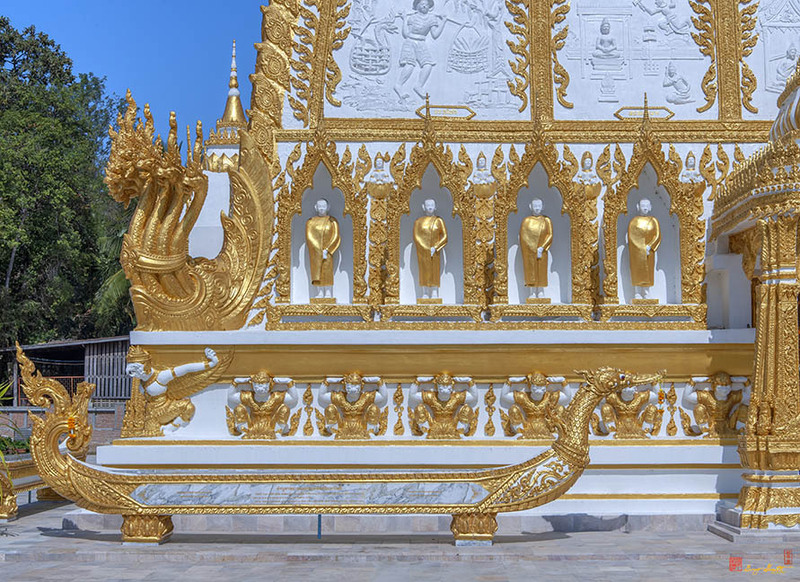 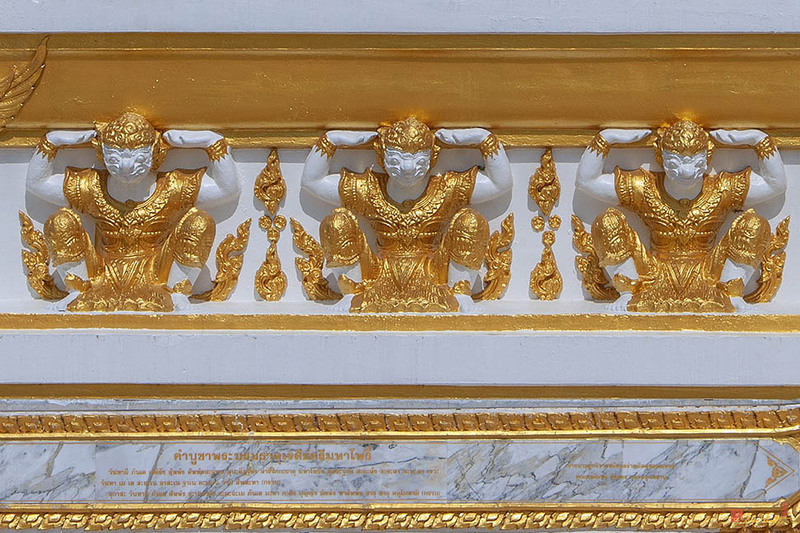 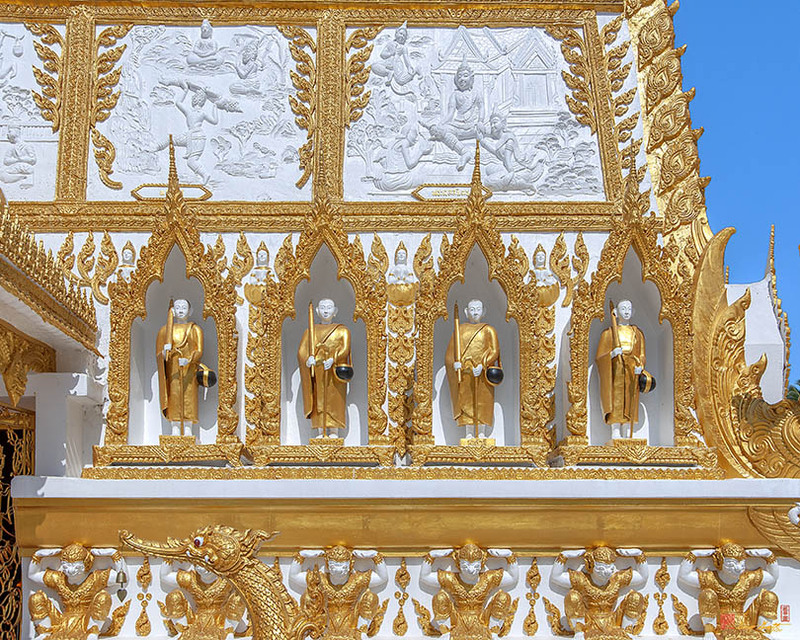 On the four corners of the pagoda base are garuda sculptures below a seven-headed naga. 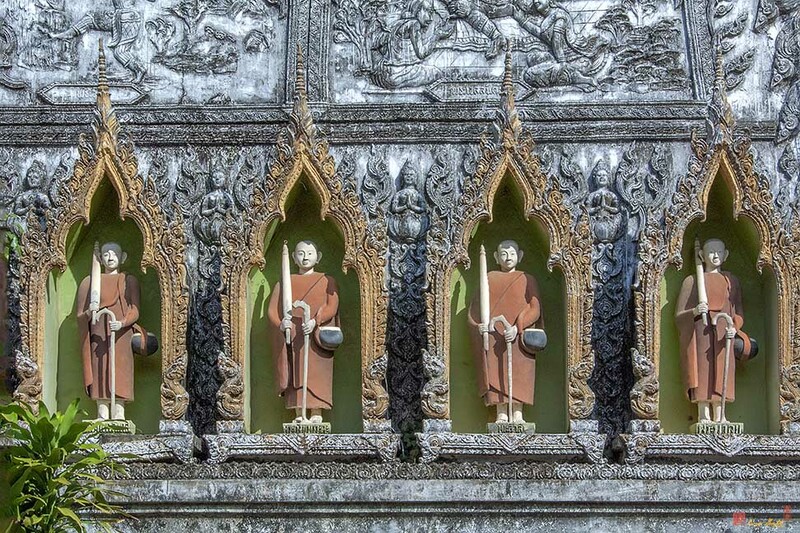 There are also Mara figures below eight monk figures. 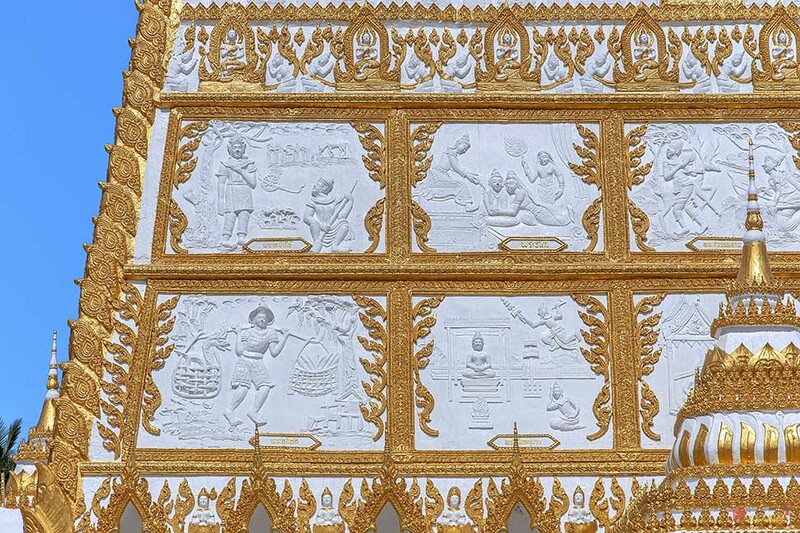 These motifs are repeated on all four sides. 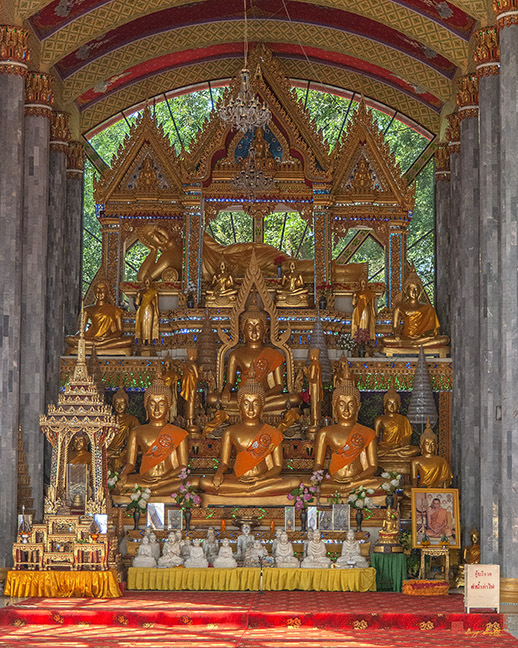 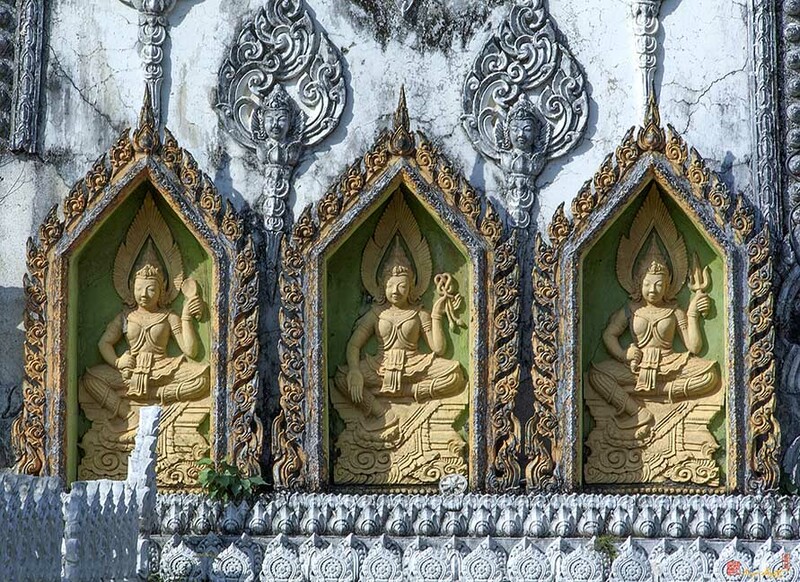 Above the monk figures are identical sculptures of the Lord Buddha's ten incarnations. 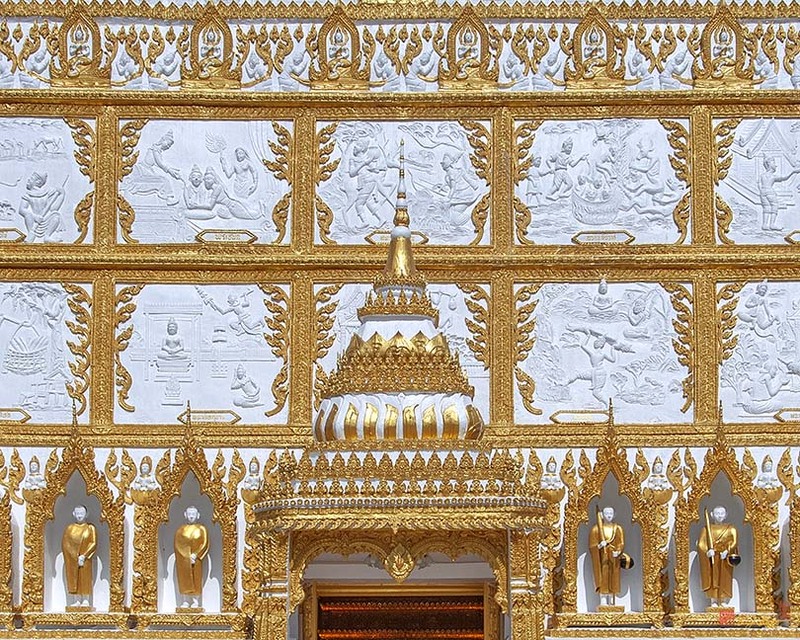 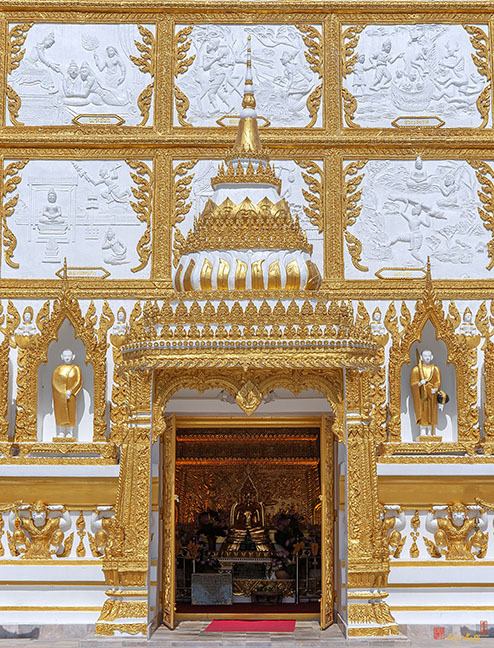 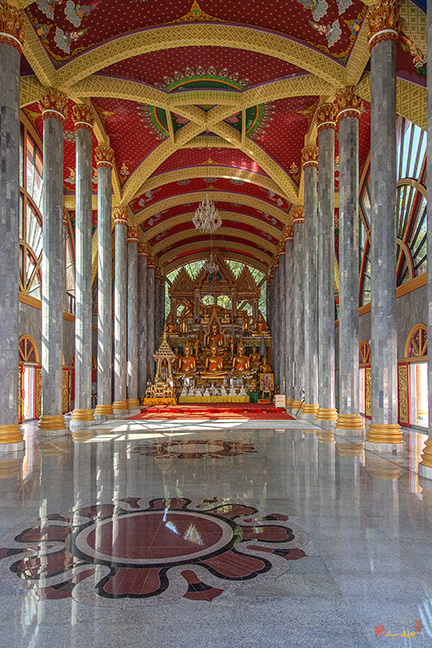 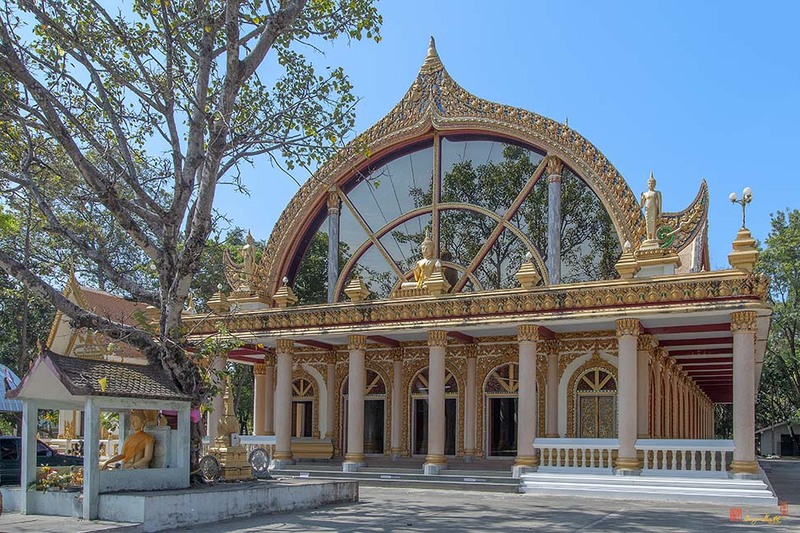 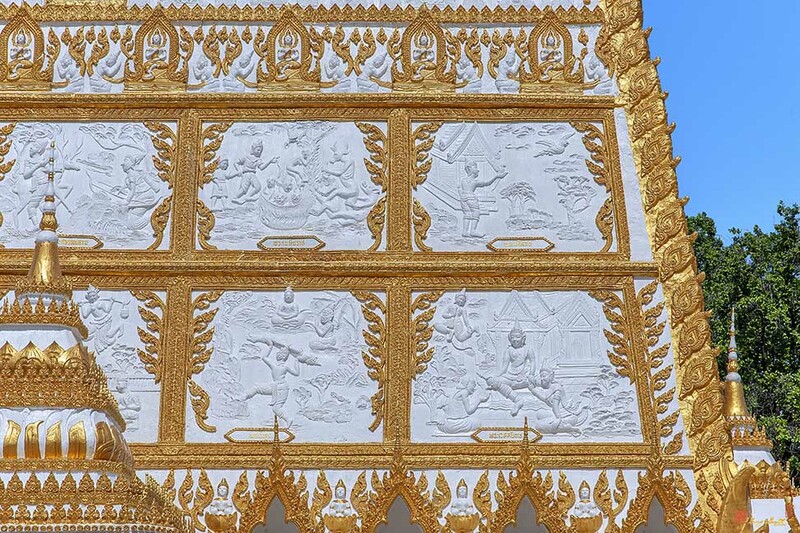 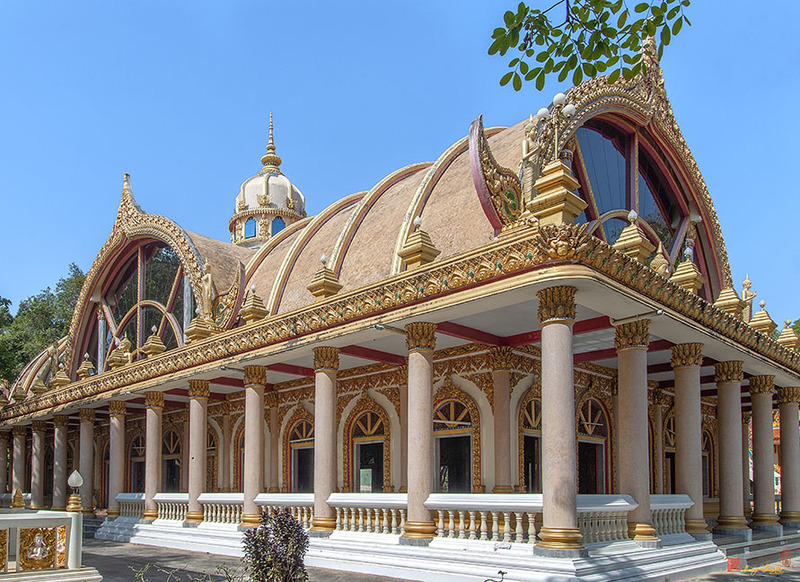 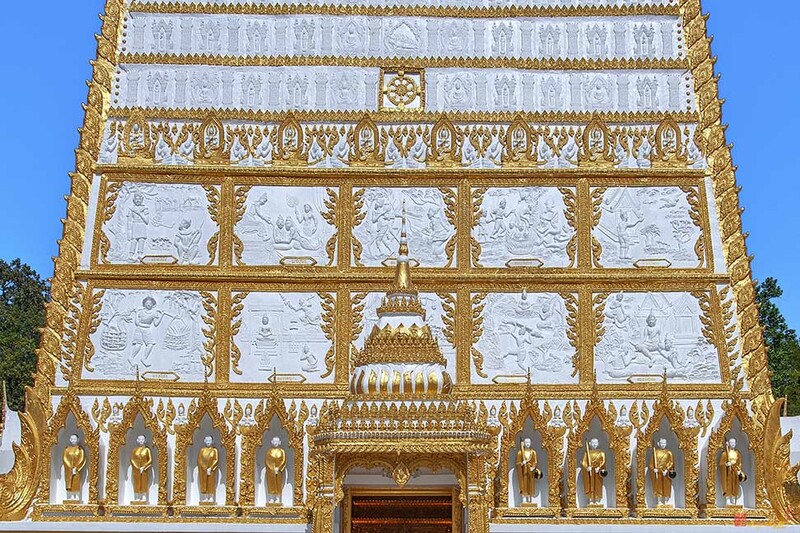 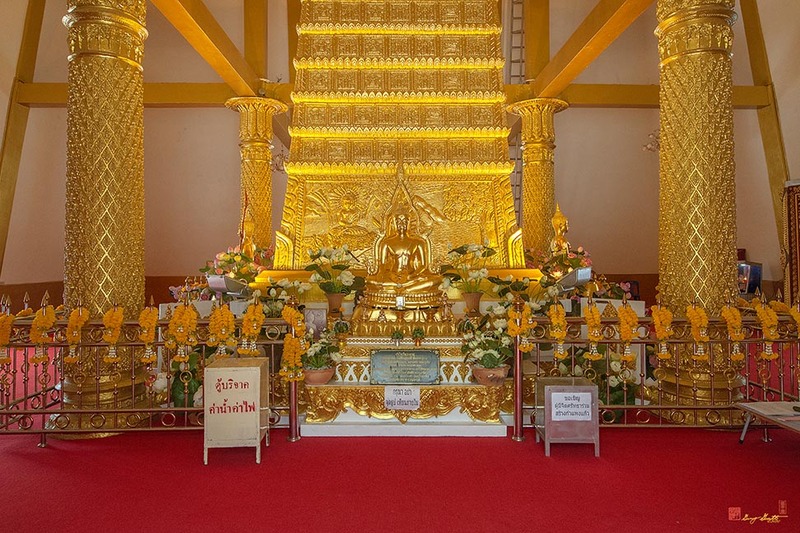 Above that level are sculptures of Buddha images in different attitudes corresponding to the Kanok pattern The temple hall is built with a three-sided gable style with a beautifully decorated arc-shaped roof and houses a Reclining Buddha image. 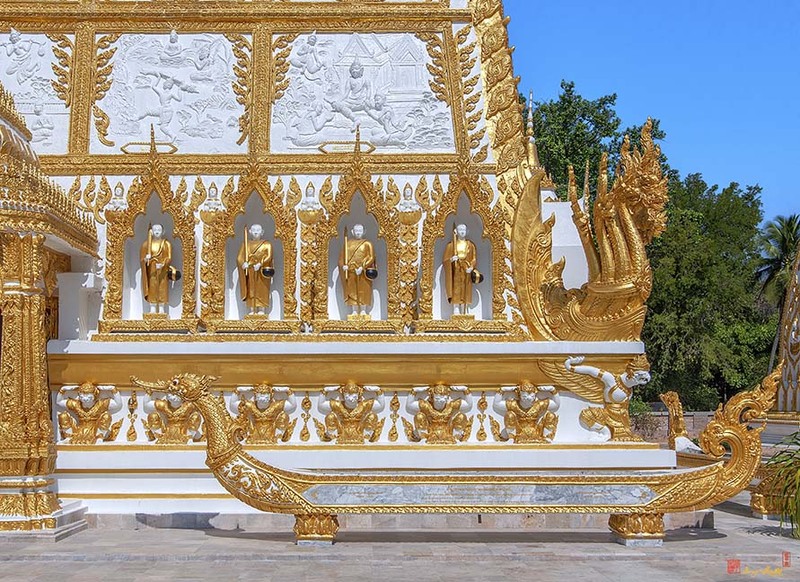 In 2009, the stupas were being refurbished with a new coat of paint and guilding and workmen were still putting on some finishing touches. 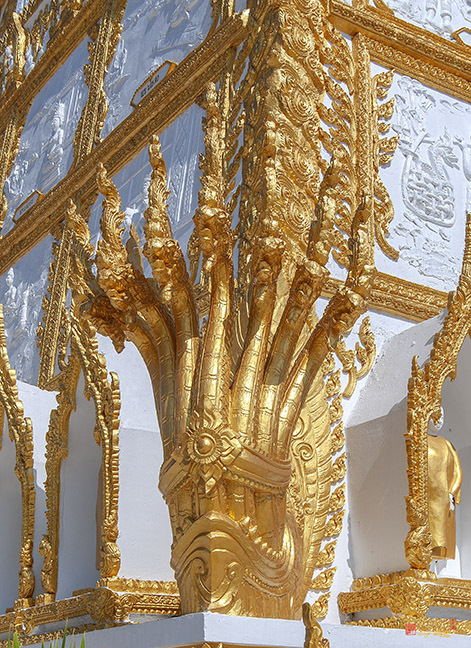 The landscaping had not been started at the time the photos were taken. 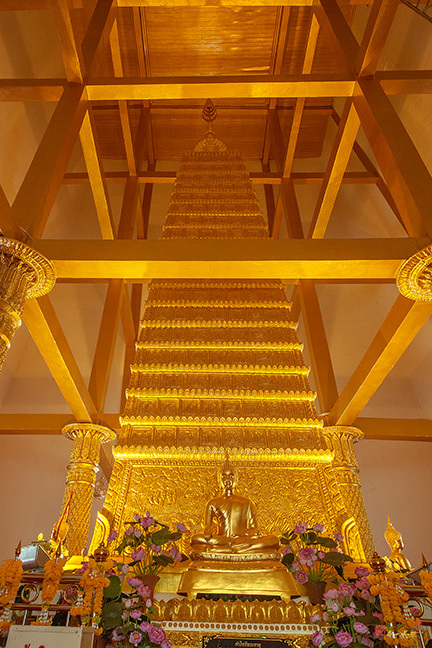 Some of the photos from 2009 are paired with photos of the same subject from 2007 for comparison.